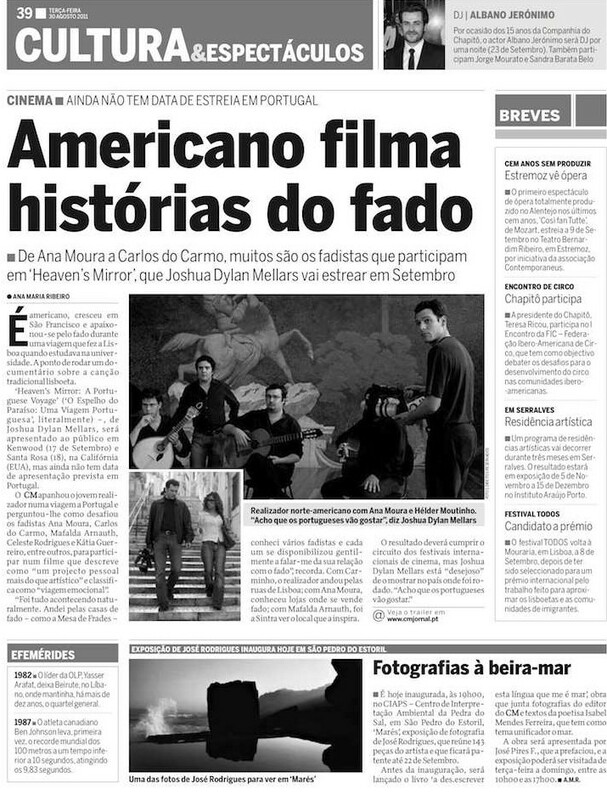 Translated from the Culture and Shows section front page of Portugal’s best selling Correio da Manhã newspaper. He is an American, born in San Francisco, who fell in love with the fado during a trip that he took to Lisbon when he was studying in college. It is the point of departure of a documentary about Lisbon’s traditional music. “Heaven’s Mirror: A Portuguese Voyage” by Joshua Dylan Mellars will screen in Kenwood (September 17) and in Santa Rosa (September 18), in California (USA), but it does not yet have a premiere date set for Portugal. “Everything came together naturally. I got to know the fado houses–like Mesa de Frades–and met various fadistas. Each one kindly spoke with me about their relation with the fado,” he said. With Camané, the director got a walking tour through the streets of Lisbon; with Ana Moura, he got to know record stores where fado music is sold; with Mafalda Arnauth, he went to Sintra to see the place that inspires her.